Last Updated: July 28, 2013 | Subscribe to our weekly newsletter! A Urine Detector for Pools DOESN’T EXIST!!! Yes, this magical urine detection chemical does NOT turn the water a certain color (normally blue) when someone urinates (pees) in your swimming pool. I’m not sure where the myth started, but from my own experiences, I would have to say that it could have started with the popular Nickelodeon show Pete & Pete. Then of course, it was made popular again in the movie Grown Ups (see image below). 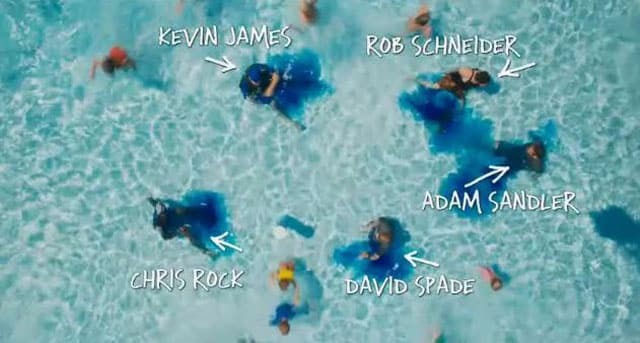 I distinctly remember a moment in the show where someone pees in a public pool and water turns a different color indicating that urine has entered the swimming pool, and outing the person who did it. It’s a hilarious concept, and it would be great if it were actually invented, but something tells me that this chemical would screw with the rest of the swimming pool chemicals in your water. Although this doesn’t mean you still can’t tell your kids that you added it to the pool to scare them into never peeing in your swimming pool. I came up with a brilliant idea this year. For parents looking to scare their kids into not peeing in the pool, try fooling them with a fake chemical. Save an empty pool chemical bottle that’s not clear. I recommended anything that looks blue or red (red is scary). Fill it with plain water. Before your kids go swimming, make sure you tell them that the bottle you’re holding contains a chemicals that will turn urine blue or red in the pool, so everyone will know who the culprit is. Pour the chemical (water) into the pool in front of the kids so that they know you’re serious. Hopefully, this hack will trick them into believing that their urine will turn color in the pool and prevent them from peeing. This hack will also work for adults who seem to think it’s ok to pee in a pool — it’s not! What If Someone Urinates In My Pool? Make sure that the pool is clean first, meaning if you can get it out, then GET IT OUT (gross I know). Make sure the pool is clear of people and you need to shock your pool. 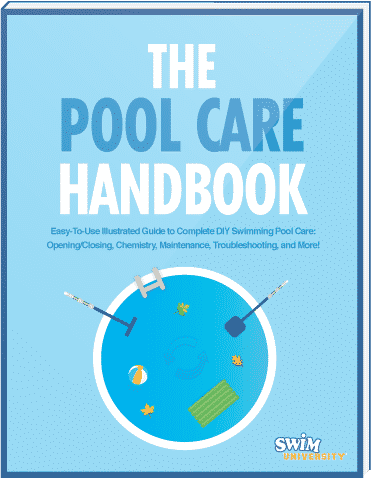 If you are using chlorine then double up the dose and run the pool overnight. It doesn’t matter what kind of swimming pool sanitizer you use, up the shocking dosage and destroy what has entered your pool so that it’s clean for the next time you use it. Just make sure that if someone pees in your pool, that you immediately sanitize the water by shocking it. How about this? If you have an issue with people peeing in your pool, don’t let them swim. Do you have green hair from a pool? This is common for people with blonde hair, but fear not because it's easy to fix and prevent. Learn why peeing in your pool is more than just gross, but also harmful for your friends and family enjoying a swim in your pool.